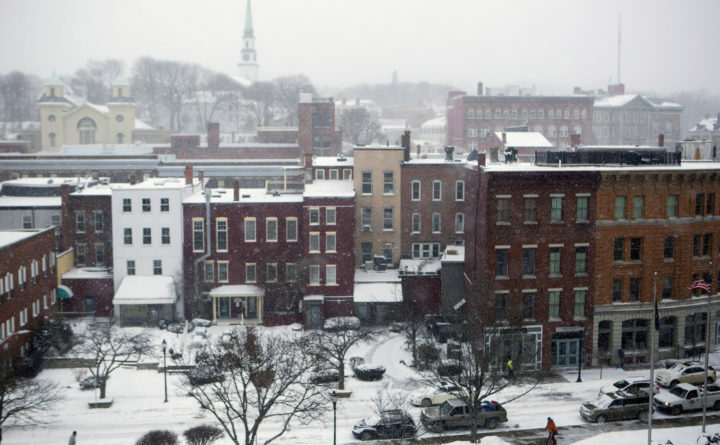 Snow falls over downtown Bangor, Feb. 9, 2017. The retail real estate market is doing well outside of the Bangor Mall buildings, with low vacancy rates in the downtown and area surrounding the mall, according to Bev Uhlenhake, an agent at Epstein Commercial Real State in Bangor. The Bangor Mall may be up for sale at auction, but other retail real estate in the Bangor area is flourishing, with vacancies at 10 percent and below in downtown and around the mall. “The downtown market has a small vacancy rate,” Bev Uhlenhake, an agent at Epstein Commercial Real Estate in Bangor, told about 1,000 attendees at the Maine Real Estate and Development Association’s annual forecasting conference Thursday in Portland. A low vacancy rate reflects a strong real estate market. Epstein’s staff compiles data on the Greater Bangor market’s industrial, retail and office real estate. Downtown Bangor experienced a slight increase in retail vacancies from 7 percent in 2017 to 9 percent in 2018, but Uhlenhake said that is not a big enough change to cause concern. The Main Street area continued to have a high occupancy rate despite the nudge up in the general downtown area, she said. The mall area, excluding the Bangor Mall building, saw vacancies decline from 10 percent in 2017 to 7 percent in 2018. And the area around Broadway, Union and Hammond streets in Bangor and Wilson Street in Brewer saw vacancies at 6 percent in 2018, down slightly from 7 percent in 2017. Epstein Real Estate said the Bangor area has a total inventory of 6.2 million square feet of retail space. Downtown Bangor has 416,318 of that. The Bangor Mall area around Stillwater Avenue and Hogan Road has 3.1 million square feet. Other areas of Bangor have 1.3 million square feet. And Brewer has 1.3 million square feet. There is another side to the low vacancy rates. “Landlords like low vacancy rates, but for growth, we need vacancies to grow,” Uhlenhake said. She added that the cost of construction is too high to justify new buildings. There is only limited speculative construction. Carol Epstein, president and owner of Epstein Real Estate, said there has been no significant increase in inventory in the office, retail and industrial real estate markets in the Bangor area. However, that will change next year when Bangor Savings Bank’s new headquarters at the Bangor waterfront is included in the data. “We’ll see new business going in to take advantage of all those people in one place,” Uhlenhake said of the nearly 500 Bangor Savings employees. Uhlenhake said she is bullish about continued development at the Bangor waterfront and the Brewer Riverwalk.